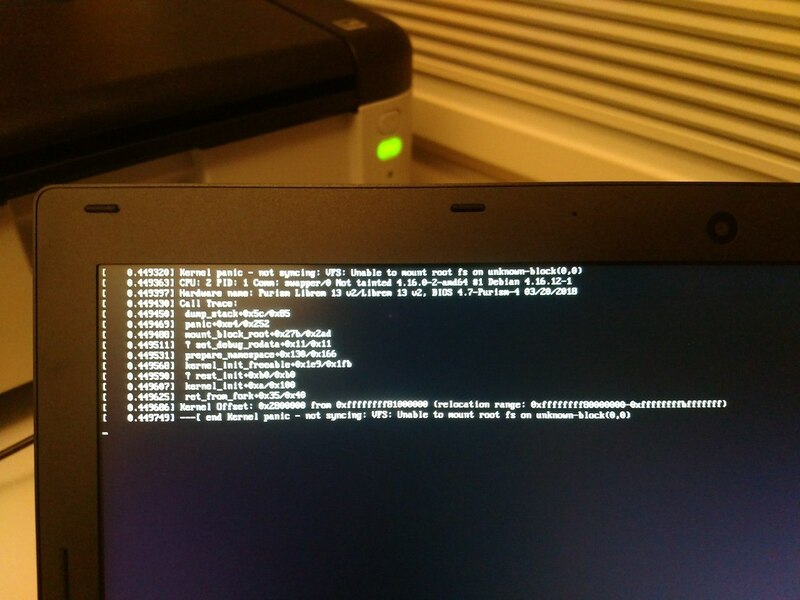 Some users reported that they cannot boot after latest updates. mladen created this object with edit policy "Restricted Project (Project)". https://lists.puri.sm/pipermail/pureos-changes/2018-May/000299.html might be the culprit, but I can't see how. I am waiting for more info about this from users. I've added a link from there to here too for 100% clarity. Appears to be 4.16.0-1-amd64 related (see forum). Retitling bug to match. 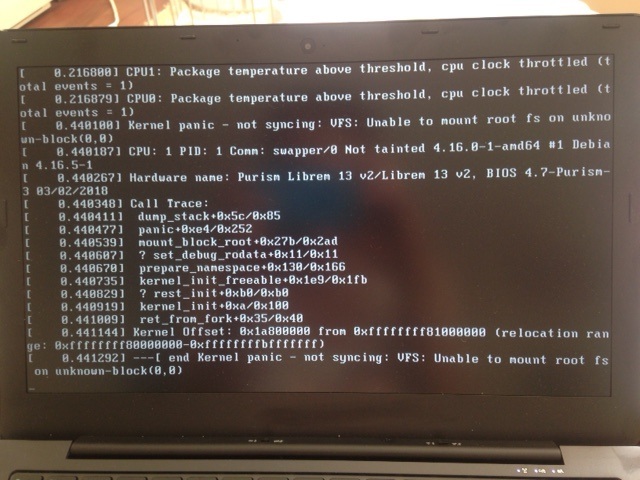 I cannot reproduce this - am running 4.16.0-1-amd64 with no issues. Customer reported that they cannot reproduce this after update. Closing as a duplicate. @mladen.pejakovic Duplicate of what, sorry? @chris.lamb This turns out to be the same issue that was already fixed (but I cannot find it now). Either way, customer(s) do not have this problem anymore. @mladen.pejakovic Would be very interested to know the problem. Could you spend a brief moment trying to locate it, otherwise this information will be lost in time..
@chris.lamb I thought this was related to T433, but it obviously isn't. But I know I have seen this somewhere before, most likely in community forums, I'll try to find the topic. Waiting for further info from the user. I believe this is an isolated issue which was fixed, and is surfacing for users who didn't update for a long time (it happens for people who update via GNOME Software Center, AFAIK update via apt doesn't trigger the bug). That's … odd. They should be calling the exact same thing. Can you provide the background etc. for your rationale? Can you provide the background etc. for your rationale? E: dpkg was interrupted, you must manually run 'sudo dpkg -- configure -a' to correct the problem. After they run sudo dpkg -- configure -a and right after that sudo apt update && sudo apt full-upgrade, the system started normally after restart. 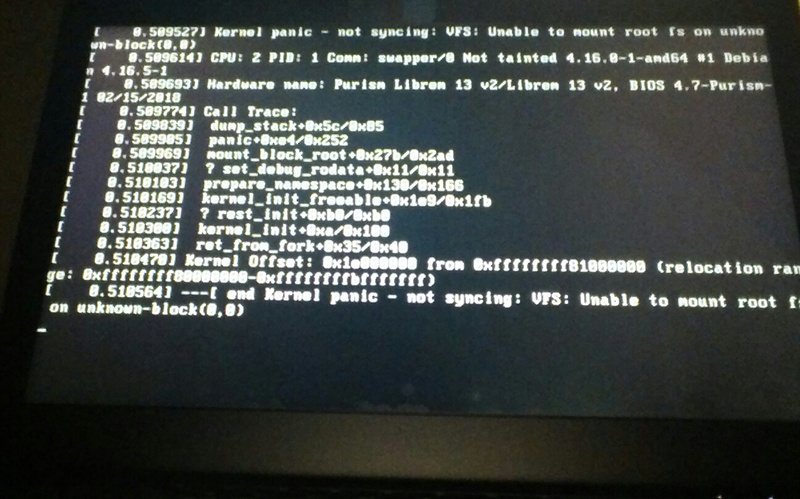 Something happened while updating via GNOME Software Center to cause the interruption. This hasn't happened to users who update via apt (at least I didn't get any reports). Thanks. So getting the logs of the Software Center failure would be the next step to resolving this, ie. working out why/what it is failing there and fixing that. At every occasion I just had to force shutdown and switch it back on. No need for any other action. I have removed the 128 GB Intel SATA SSD and replaced it with a 500 GB Samsung 970 Evo NVMe M.2. 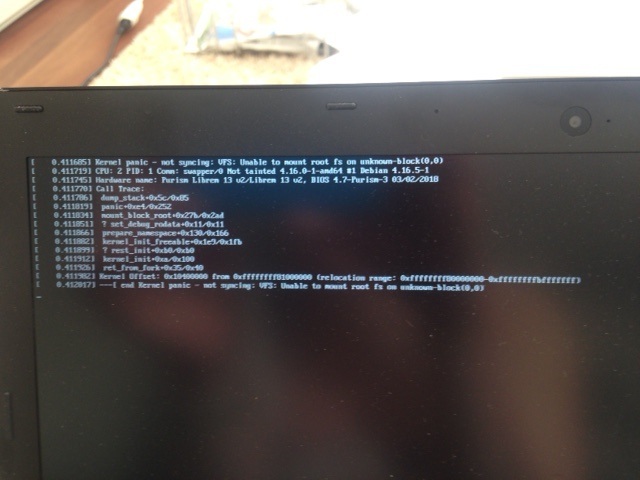 I did install PureOS from scratch and did not encounter any kernel panic. Issue related to Intel SATA SSD?